Spending a holiday in the hospital can be even more stressful than the typical hospital stay. The patient may be concerned about what is going on at home or thinking about all of the things they should be doing to prepare for a holiday event. When someone is accustomed to being the host for Thanksgiving and all that goes into preparing the house and the meal, it may be difficult to allow someone else to do those things. Missing out on festive events combined with feeling ill can make things even worse. If your loved one is in the hospital during a holiday, there are many things you can do to brighten their spirits and improve their recovery by visiting during their hospital stay. This doesn't mean you should bring a vat of spiked eggnog to the bedside, or an entire feast including a twenty-pound turkey, but it does mean that you should include your loved one in the holiday spirit. Talk to the nurse taking care of your friend and find out if bringing the holiday meal to them would be appropriate. For some patients, food and drink are not permitted, and it would be unkind to eat a holiday meal in front of them, but for others, a plate of the Thanksgiving feast would be a welcomed change from hospital food after surgery. New Year's Eve can be celebrated in the hospital, watching the ball drop on television and celebrating with a non-alcoholic toast at midnight, but plan on skipping the noisemakers. If your typical New Year's Day includes corned beef and cabbage consider delivering a plate to the hospital. If your friend is a patriot and is upset about missing the 4th of July celebrations, make sure they get to watch the fireworks on television and bring some picnic food along. For children, having favorite foods and treats that they associate with the holiday may help ease their sadness. Missing out on an Easter basket, Christmas cookies and trick-or-treating may create anxiety, so consider making those occasions a reality in the hospital. The traditions you typically follow may have to be altered, but being able to experience a similar version will be particularly important for a hospitalized child. What If My Loved One Can't Eat? Holidays are about more than food, even if our waistlines often say otherwise. Major holidays do often feature food, but the gathering of friends and loved ones is the truly important part of the day. Remember that these occasions are built on spending time family; the feasts that come along with the holidays are merely a bonus. For patients who are on a special diet or not permitted to eat, the holiday can still come to the hospital. The gift of your time and company may best part of the holiday, with or without food. Christmas stockings can travel to a hospital, as can an Easter egg hunt made up of non-food items to be located. Dressing up for Halloween is often the best part of the day, whether or not trick or treat is included. Will your loved one be in the hospital for an extended stay? If so, a few decorations might be appropriate. A tiny Christmas tree or menorah, or even a Christmas tree drawn by a grandchild will brighten an otherwise dreary hospital room. White sheets, white pillows, and white blankets can feel sterile and not very festive. For most patients, a festive blanket or pillowcase is an ideal way to bring cheer to the room, along with comfort. Hospital beds are not a standard sheet size, so those should remain hospital issue, but the pillowcase and blanket are easily changed and clean linens from home are likely softer than the ones the hospital provides. Many hospitals have televisions in the patient rooms that will accommodate DVD and VHS players. Consider bringing upbeat or favorite holiday movies to the hospital. Just remember, if your loved one had chest or abdominal surgery, laughter may be painful, so choose the movie accordingly. 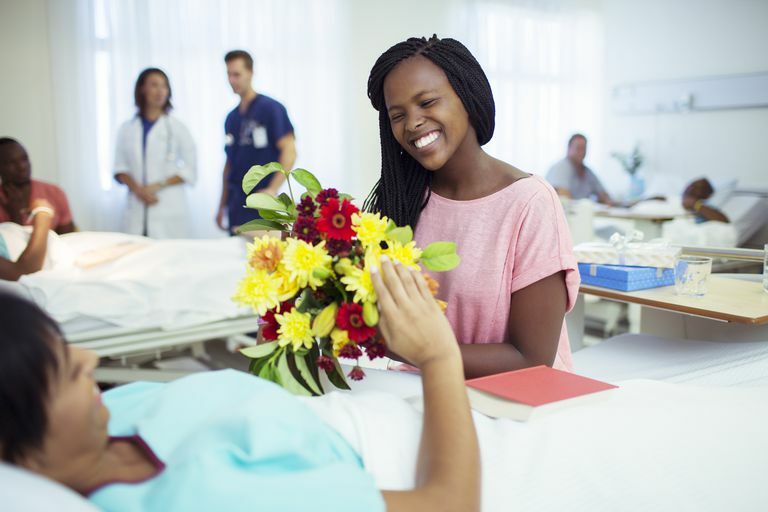 Even if you wouldn't normally give someone a birthday or Christmas present, a small token while they are in the hospital can be meaningful and brighten their spirits. Again, some patients are not permitted to eat or drink while in the hospital, so be sure that your gift of food is appropriate before delivering it only to find that the nurse takes it away. Avoid flowers as many patients are allergic to flowers and some areas of the hospital ban flowers completely. Some hobbies don't travel well, but others can easily be brought to the hospital. Needlepoint, crochet, and sewing are good examples of portable hobbies that are appropriate to bring to the hospital while bringing an instrument probably isn't such a good idea. If your loved one has a hobby that isn't too loud, too cumbersome or too messy for a hospital room, they may appreciate having the ability to work on projects while healing. Many people enjoy catching up on their reading while in the hospital, so books and magazines are welcome, and can even be left for the next patient who needs a distraction. Great gifts for the hospital focus on comfort and passing the time and are appropriate for the individual. For children, games, books, quiet toys and art supplies are favorites. Avoid games and toys that make a lot of noise as they may be disruptive to the sleep of other patients. Teens who are computer savvy—and have their computer with them—may enjoy a gift card for iTunes that will allow them to purchase movies or music. Computer games, books, playing cards and board games they can play with visitors are a great diversion. For adults, consider their likes, if they enjoy reading they may enjoy a book or a selection of magazines to pass the time. The gift or loan of a small music player and a few selections of their favorite music is often welcome. Hospital patients need rest. Plan to be a good visitor, not one who makes life harder for the patient. Unless your friend is eager to have company or someone present in the room at all times, keeping your visits short and sweet may be ideal. Empower your loved one to doze, or even to let you know when they are ready for some quiet time and they would like to end the visit. Let the patient guide conversations. They may want to talk about their illness or they may want to talk about everything under the sun except their illness. Let them direct the conversation to their hospital stay and the reasons for it if they choose to, otherwise, talk about whatever seems appropriate. Avoid upsetting topics—and heated debates about politics—unless the patient guides the conversation in that direction. Finally, and most importantly, do not wake a sleeping hospital patient unless they have requested that you do so. Many patients have a difficult time falling asleep away from home, or they have pain that makes it difficult to sleep. You can always leave a card or a note that says you have stopped by, or leave a gift to surprise them when they wake. Either way, your thoughtful gesture will be appreciated and they will get the rest they need if you respect their need for sleep. It is an act of kindness and generosity to bring a holiday to a loved one in the hospital, particularly when holidays are often very busy and full of activity. This type of visit need not be stressful or turn into a party, a quiet visit may be just the right touch for a lonely patient. Keep in mind that just because it is a holiday doesn't mean the patient won't need their sleep. Take your cue from them: if they look sleepy let them rest, and if they look invigorated by the holiday visit take your time with them.